There are many versions of the Dr. Seuss-inspired Grinch Christmas tree (like this miniature one! ), from Whoville-esque trees adorned with candy-coloured ornaments to snow-covered, oddly-shaped trees that set the scene outdoors. Perhaps the most iconic is a tall, skinny evergreen wound up with wire with a heavy ornament dangling from the curved-over top. These represent the trees that Mr. Grinch robbed of ornaments then shut like an umbrella before tossing in his giant sack. Quirky looking and cartoonish, a Grinch tree’s message is that Christmas isn’t about presents, or ornaments, or trees, or even roast beast. It was Christmas 2011 when I was feeling a little blue during the holidays and I wasn’t in the mood to celebrate much. By some magic, a Grinch tree entered my life and Christmas was saved! You can read all about the Magic of the Grinch tree here. Bonus: you will get to see how much Meatball resembles the Grinch. After I published that post, I proceeded to field what seemed like endless emails from people ALL OVER THE WORLD trying to order the tree. I was blown away! I emailed everyone back to say that I had described in the post how I made it, but they just wanted me to make them one, or fifteen, and in, like, the next two days, and then ship it across the content. I considered making them (for a minute) but since I’m more about “teaching someone to fish” than “fishing for them” I planned to write a tutorial for how to make a Grinch Tree someday. 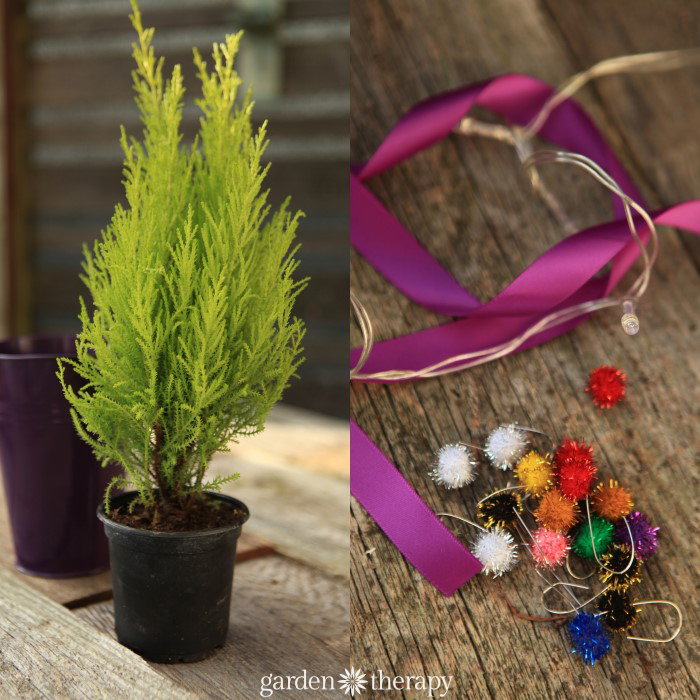 That is really the whole point of everything I do here on Garden Therapy: showing how to make some fun garden or garden-inspired project that gets people jazzed enough to give it a try. 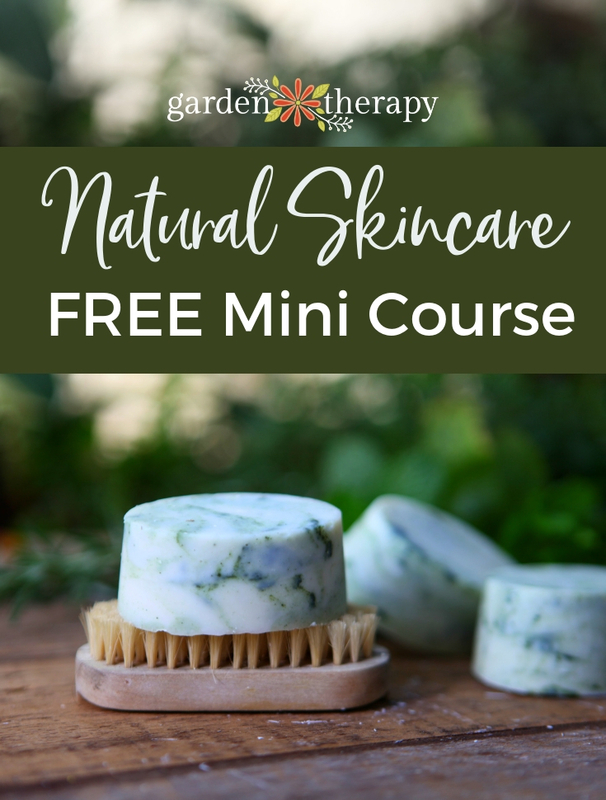 My hope is that they just may catch the gardening bug, get outside, have fun, and sing the praises of gardening to all like those little Whoville kids. I have big dreams. 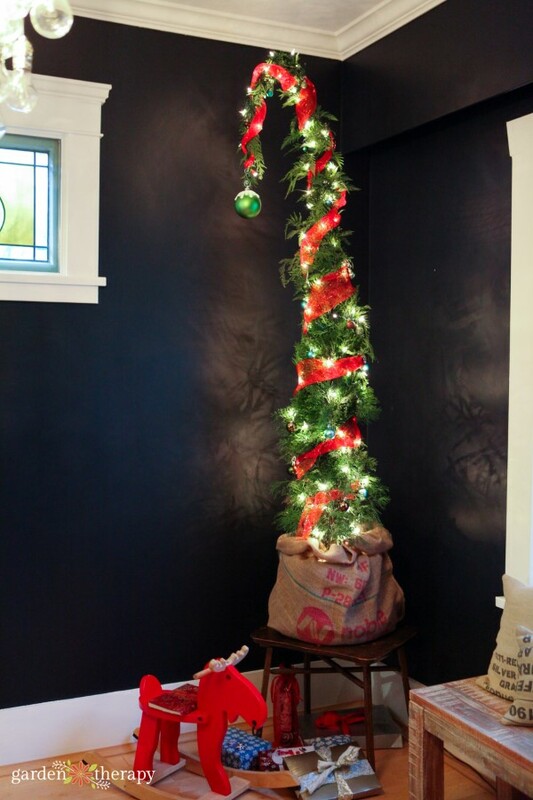 Anyway, I politely told folks how to make the Grinch tree and the ones who made them sent the praises of a) how much fun it was, b) how easy it was, and c) how everyone loved their unique tree. 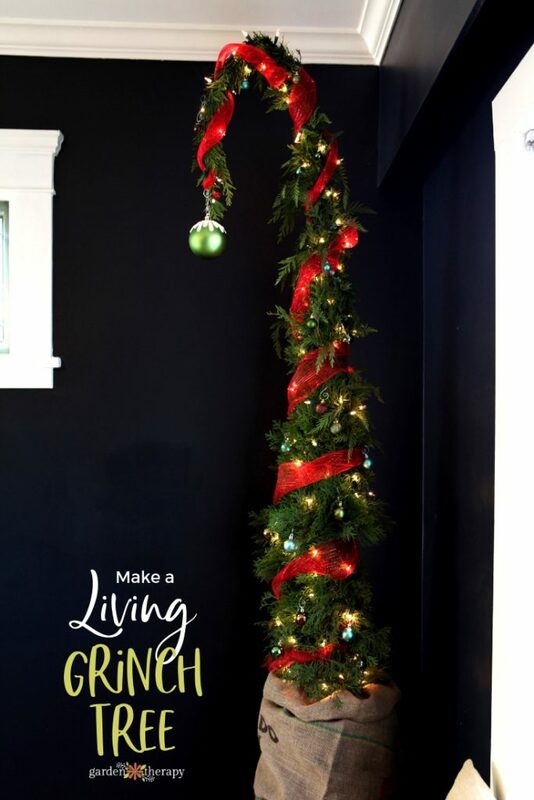 Today I will break down the whole thing, step-by-step and not just for a regular old Grinch tree, nope, today you will learn to make one that is nine-feet tall! Choose a full cedar shrub that is healthy, stands upright, and is symmetrical. 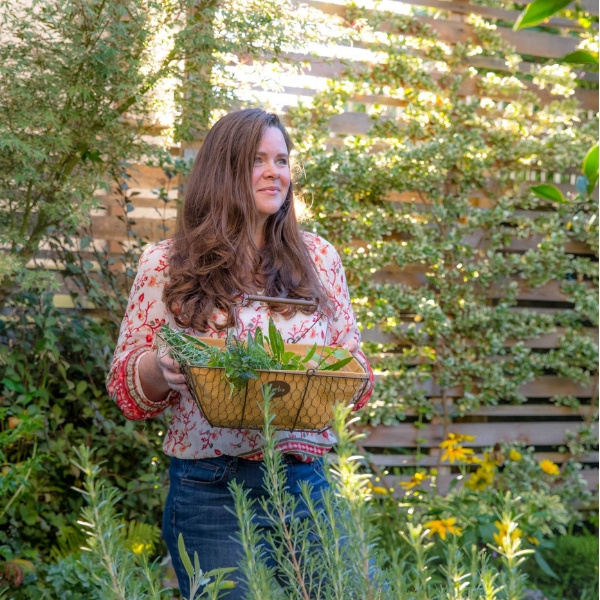 I used a 5′ cedar hedge because that was what was available during the winter months. If you think ahead and grab one when there are plenty of nurseries open that are full of 8′ hedges, you will have an easier time fashioning it into a Grinch tree. 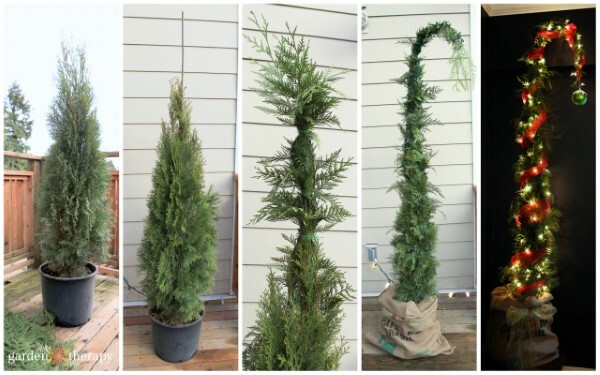 Begin adding boughs of cedar to build up the tree at the top, covering the plant stake. Start the cedar branches starting from below the stake with the leaves facing upwards, and layer more and more onto the stake to fill in branches all the way up to the top. Continue adding branches and securing it with the garden wire until you have the rough shape that you want, with at least a foot of cedar draping from the very top of the plant stake. Reserve a few branches for filling in spots once you have bound the hedge. If the tree is unstable at all, use 1-2 more stakes inserted in the center of the plant and use wire to attach it. 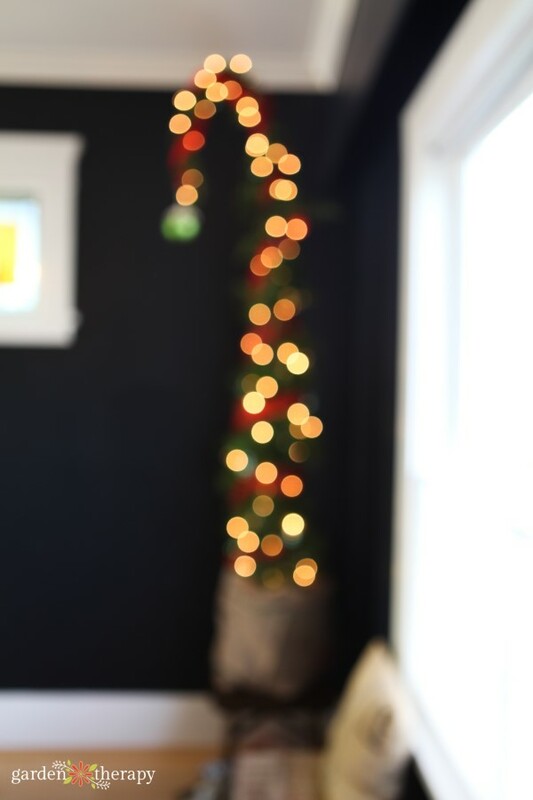 Now, when you have the height and fullness you want, you can begin wrapping the lights around the tree. Start at the bottom and wind miniature white lights around the tree, fairly snugly, tucking in floppy branches as you go. The final look should be a bound, skinny, evergreen tree with a floppy top. Place the pot on the plant tray and set the whole thing into the burlap sack. Use ribbon to tie the sack at the top. and add a large but fairly light ornament to the very top of the tree. At this point, you can really personalize it. 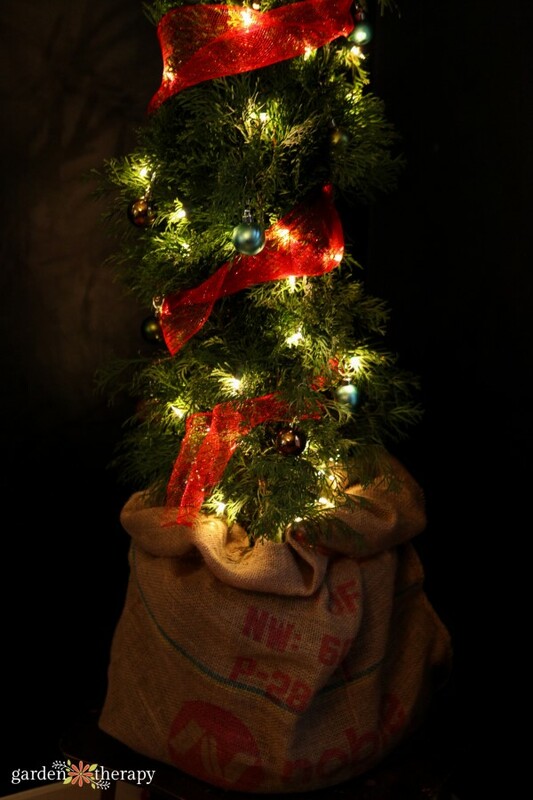 The tree is complete as it is, but you can add some of your favorite ornaments as well. I would recommend small ones so to not overpower the skinny design. Want a smaller version? 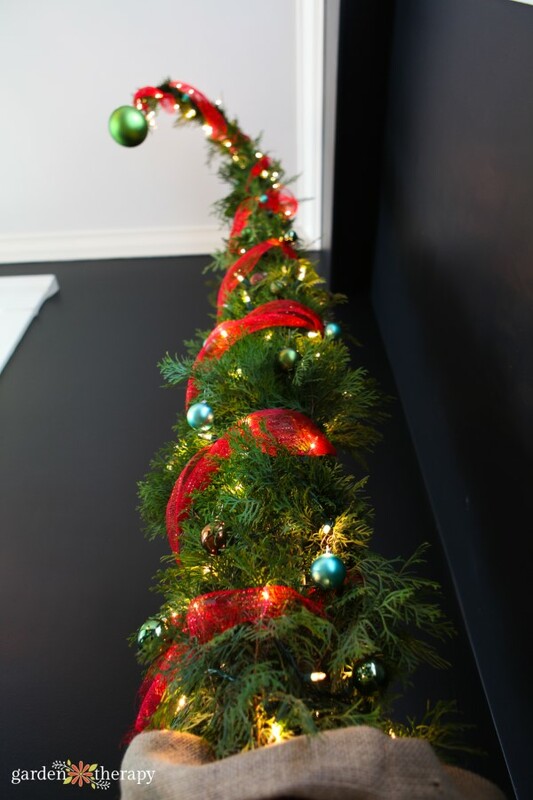 Check out how this table top Grinch tree turned out! 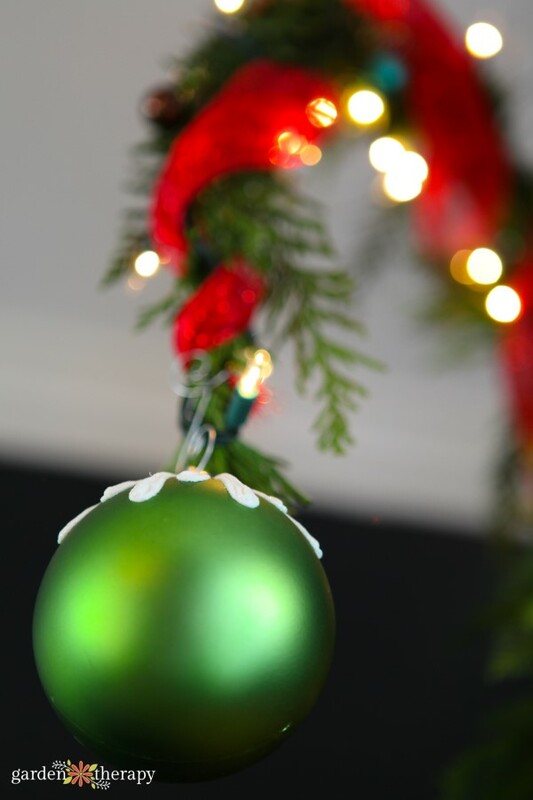 I always enjoy your blog but I absolutely loved the grinch tree! Jess, I got them in the woods but they are also available in garden centers.